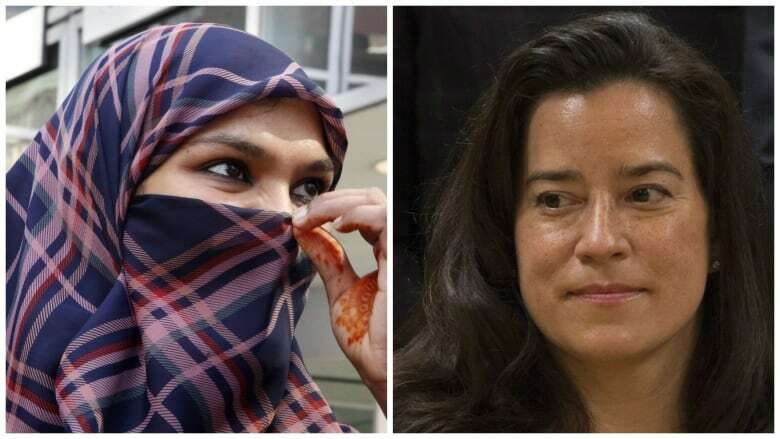 Justice Minister Jody Wilson-Raybould says the federal government has formally withdrawn a controversial court challenge involving the niqab. The federal government has formally withdrawn a controversial court challenge involving the niqab, says Jody Wilson-Raybould in her first act as Canada's attorney general and justice minister. The Conservatives had asked the Supreme Court of Canada to hear a request for an appeal of a court decision allowing women to wear face veils such as the niqab at Canadian citizenship ceremonies. "As a government, we uphold and respect the decisions of the two courts," said Wilson-Raybould during a news conference in Ottawa on Monday. "In all of our policy as a government we will ensure that we respect the values that make us Canadians, those of diversity, inclusion and respect for those fundamental values." The case started with a lawsuit from Zunera Ishaq, a devout Muslim who agreed to remove her niqab for an official before writing and passing her citizenship test two years ago. However, she objected to unveiling in public at the oath-taking ceremony. Ishaq successfully challenged the Conservative government's ban on wearing the niqab while taking part in the oath of citizenship. The Conservatives appealed the ruling, but Ishaq took the oath last month. Wilson-Raybould said she spoke with Ishaq earlier today and was "pleased" to inform her of the government's decision. "We had a good conversation," she said. In a telephone interview with CBC News, Ishaq said she was excited and honoured to speak with the minister, calling today's announcement a "very good gesture from the government in supporting minorities." "I'm very thankful for the government's support and understanding in this case and I want to thank the minister who took the time to talk to me." Former prime minister Stephen Harper had previously said most Canadians believed it was "offensive" for would-be citizens to hide their face at the moment they become Canadian. A public-opinion poll ordered by the Harper government before the recent federal election found Canadians overwhelmingly in favour of a niqab ban at citizenship ceremonies. The issue of whether women should be able to wear the niqab during citizenship ceremonies became a controversial topic in the campaign. The Conservatives argued that face coverings should be banned during citizenship ceremonies. The Liberals and the NDP said women should be able to wear the niqab — a position said to have cost the NDP support in Quebec. Ishaq told CBC News she was "very sad" to see the niqab become a "divisive issue" during the election campaign. "The ex-prime minister tried to manipulate the people but the results have shown us that general Canadians are sensible people, they know and do accept cultural differences...," Ishaq said. The mother of three small children said she felt "a little unsafe" in the last weeks of the election campaign, following a series of incidents of verbal and physical abuse against Muslim women. Ishaq was granted Canadian citizenship in time to vote in the general election of Oct. 19. "It was a wonderful experience," she said.